Join our community and access all our free online resources to help you in your digitization journey. •Access to download Bizagi products. Enter your email address and then click Send Code. We will send an email to the provided address containing a verification code. This code will expire in 24 hours. •If you enter an invalid code three times, the code request will be blocked for three hours. •If you request a code five times without entering one, the code request will be blocked for 24 hours. Enter the verification code to enable the registration fields. Fill-in the registration information. Alternatively, you may sign up using your Microsoft or Google account. 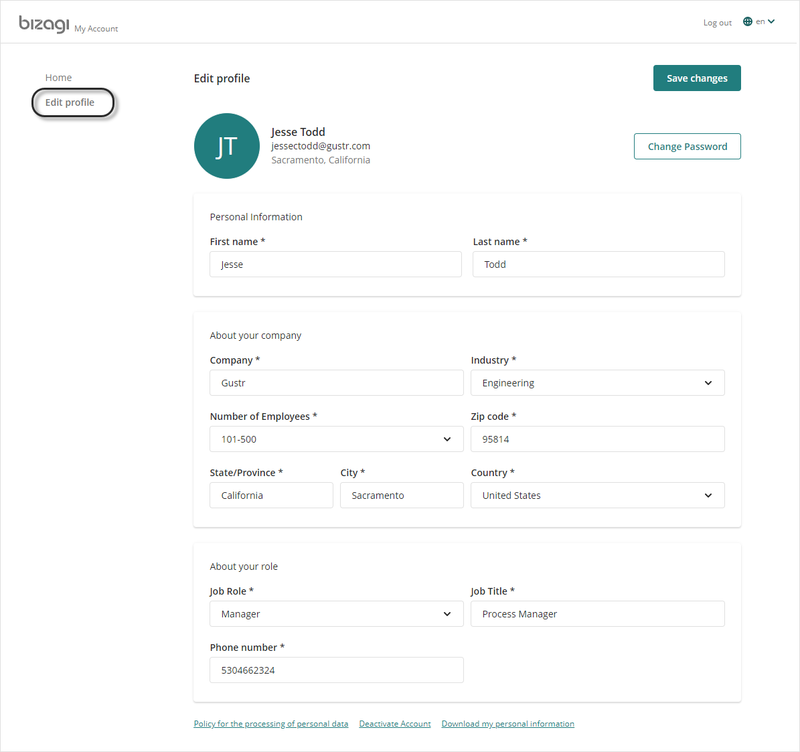 When using this option, you will be prompted to allow Bizagi to have access to your email address and your basic profile information. 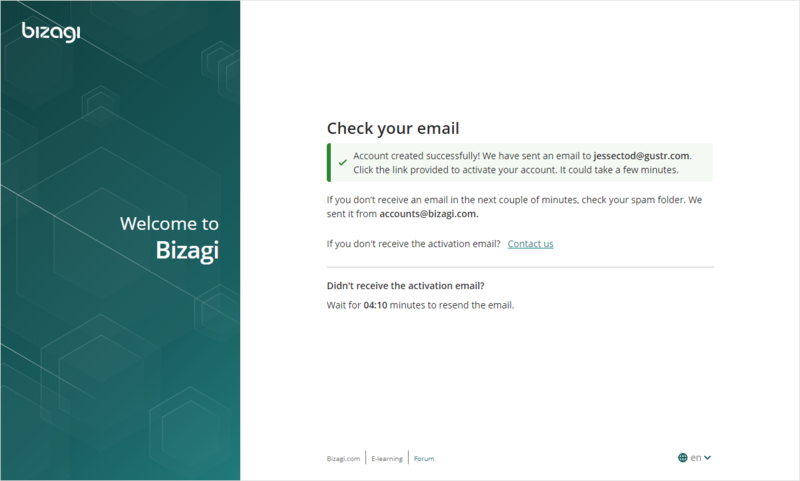 Once you grant permissions to Bizagi Accounts, you will be redirected to your profile. Click Profile Information in order to complete your Profile and finish your registration. 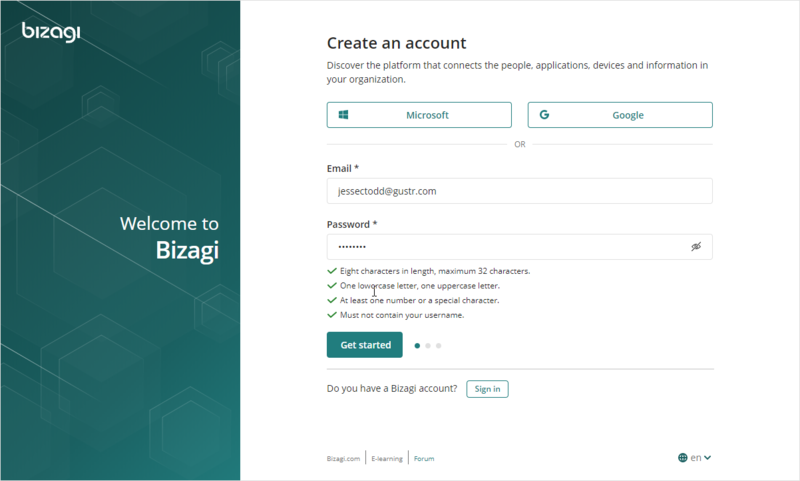 You will be requested to log in when you open Bizagi Studio. You need to sign in only once. Type your email address and password to login. When your credentials are verified the login window will no longer be displayed. Remember that registering gives you access to all our free resources. 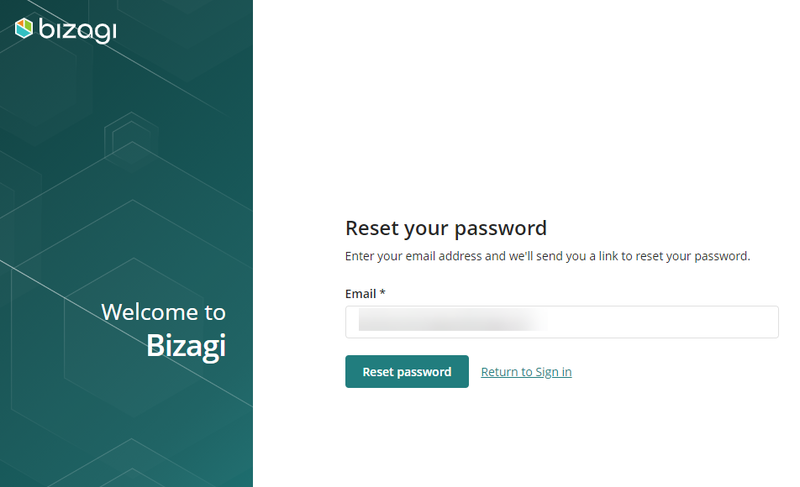 Through https://account.bizagi.com, you may update your profile information and change your password anytime. 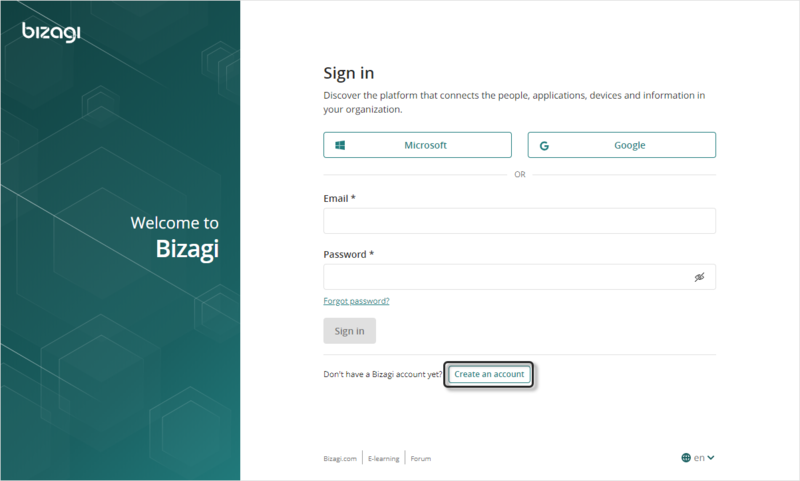 You can also access this menu through http://www.bizagi.com and logging in to your account. 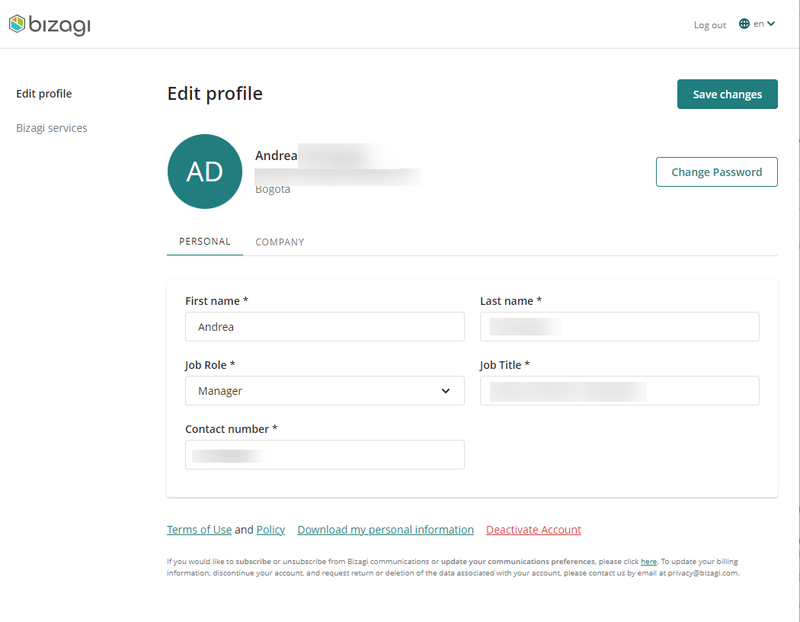 Click Profile Information to manage your data. To change your password, click Change Password button. Type the email used for registration and click Request Reset code, in order to request the verification code to let you change the password. If your email address matches with the one registered, we will send the verification code. This code will expire in 24 hours. 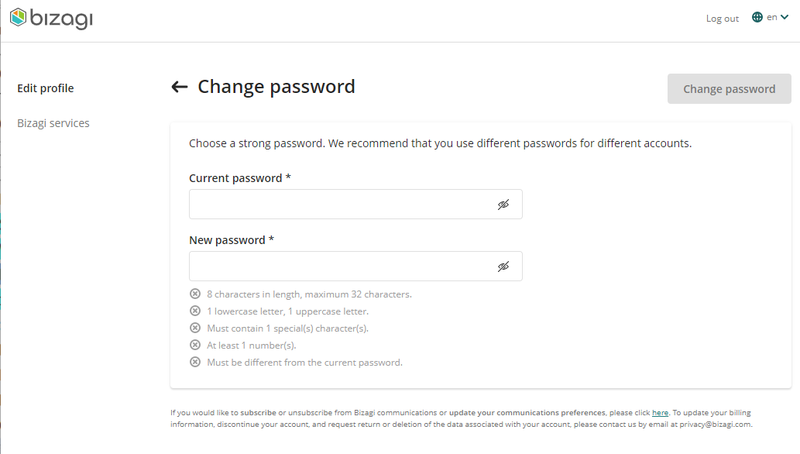 Enter the verification code and then, fill-in the new password twice and click Change your password. To DEACTIVATE your account, scroll down to the bottom of the page and click Deactivate account. Bizagi will send you a code to confirm the deletion. The General Data Protection Regulation (GDPR) is an European privacy law that strengthens data security and governance regarding personal data of individuals, throughout the principles and requirements it mandates. Privacy and security are always top critical aspects for Bizagi Ltd. and we are committed to the GDPR compliance. 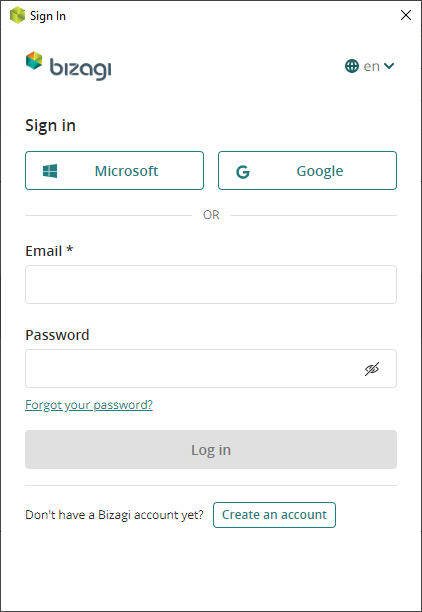 •GDPR compliance in Bizagi Website to learn how your data registered at Bizagi.com is kept under GDPR compliance. •How to support GDPR to learn about how your processes comply to GDPR, so that you as a customer, can offer to your end users, those options needed to enforce GDPR individual rights.